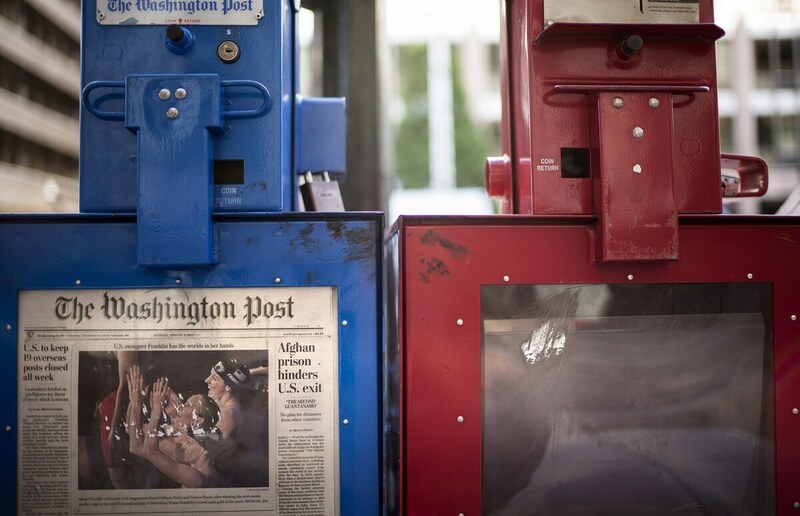 The Tricky Business Of Predicting Where Media Will Go Next One of journalism's most recognizable mastheads, The Washington Post, is entering a new era with a new owner. In 1992, the paper's managing editor urged it to get at the forefront of the upcoming digital revolution, but it so far has fallen short in a world of fast-paced BuzzFeeds. On Monday, the Washington Post Co. announced the sale of its newspaper to Amazon CEO Jeff Bezos, a move that comes as the paper struggles to keep up revenue. What's next for The Washington Post? With a new owner, the paper is stepping into a new era. Its path may lead to the ever-evolving future of journalism. "There is no map, and charting a path ahead will not be easy," said Amazon founder Jeff Bezos with the announcement of his purchase Monday. "We will need to invent, which means we will need to experiment." Experimentation and leaps of faith led to the Huffington Posts and the BuzzFeeds of the current media world. While advertising revenues decline and newspapers change hands, some still see a place for institutions like The Post (apparently, Bezos thought it was worth $250 million). But the face of legacy media will not look or feel the same. Bezos' message on Monday echoes a prescient one made two decades earlier, by the Post's then-Managing Editor Robert Kaiser. Kaiser had just attended a conference convened by Apple in Tokyo. On the plane back to Washington, D.C., he wrote his takeaway on a yellow legal pad, now available online. The conference, involving leaders in the computer, software and media worlds, offered a glimmer of how technology could — and would — revolutionize the media industry. In 1992, Robert Kaiser, then managing editor of The Washington Post, attended a conference on the future of media and technology. He then wrote a memo to The Post's publisher, sharing ideas about what a newspaper could look like online and how text and images would one day be shared via computers. "The Post ought to be in the forefront of this — not for the adventure, but for important defensive purposes," Kaiser wrote in 1992. "We'll only defeat electronic competitors by playing their game better than they can play it." Though he had his warnings, Kaiser wrote that he could "find no one at this conference who would predict the demise of the newspaper. No one. All saw an important place for us." And so, Kaiser expected, "There's a big and important role for The Washington Post in this new world." But the revolution didn't happen the way Kaiser had hoped. "The fact is, because we were so big, so fat and so happy, and because everything seemed to be going our way, we were just in no frame of mind to take the big, adventurous steps that would have been required to really, you know, try to become pioneers in this realm," he tells Jacki Lyden, host of weekends on All Things Considered. Arianna Huffington upended the traditional news model in 2005 by starting The Huffington Post, but she doesn't see ventures like hers as substitutes for newspapers. "I don't really think it's a question of replacing newspapers. I think it's a convergence," she tells NPR. But The Huffington Post, aggregating and re-posting content from across the Web, had many skeptics. "I think there were definitely many more naysayers than people who thought it would work," Huffington says. One LA Weekly review was particularly unsupportive: "This website venture is the sort of failure that is simply unsurvivable. Her blog is such a bomb that it's the movie equivalent of Gigli, Ishtar and Heaven's Gate rolled into one." But in what others saw as lowbrow Web content, Huffington saw opportunity to share and engage. She breaks the model down into four elements: blogging, curation, commenting/audience engagement and original reporting (which played a larger role as the site's popularity and profitability grew). At first, curation, or aggregating content from other websites, in particular received backlash from traditional media, which viewed the practice as hawking others' work for free. But, Huffington says, if curation is done accurately and fairly, it "is of tremendous benefit to the creators of the content, because it brings them many more eyeballs, a lot more traffic, which they can monetize." Now, curation is a common practice among news organizations of all statures. The result of mixing these elements was something that didn't look quite like anything else. "The fact that we can have the prime minister of France next to a homeless teenager who has something interesting to say, is something that is very much at the heart of what distinguishes HuffPost as a purely digital operation," Huffington says. But in eight short years, even The Huffington Post is now challenged by forward-moving competitors, like BuzzFeed. Its founder and CEO, Jonah Peretti, came up with the idea for the site while working at The Huffington Post, which he co-founded. After launching in 2006, BuzzFeed "was very much a laboratory" in the beginning, says company President Jon Steinberg. BuzzFeed started with six employees in a room in New York's Chinatown. The driving concept behind the operation: social sharing. "Everything we write has to be shareable," Steinberg says. "And we think that's a really high bar. As opposed to writing for a search engine or writing for a robot of some kind, the content has to be compelling and novel and interesting enough that a person is willing to pass it along to another person." With An Industry In Turmoil, Why Buy A Newspaper Company? At first, the stories were mostly light and entertaining. But as interest grew, BuzzFeed realized untapped potential in its growing, young audience. "Young people really have no media that is their own. Arts and leisure sections and real estate sections talking about expensive things doesn't really appeal to a younger generation where memes and Web culture is their culture," Steinberg says. "We felt that we could be the place that they come to for their hard-hitting news and reporting." Like any other traditional news organization, reporters at BuzzFeed write about what they're interested in and what their editors assign to them, he says. But they also get training in how to write for the "social Web." "We don't give additional fuel to things that are not being shared," Steinberg says. If a story isn't getting attention, it falls off promotional spots on the site. BuzzFeed has also found a way to avoid charging for its content. "We just find that the economics of the Web allow us to thrive with a new kind of advertising model and not be reliant on paywalls or subscriptions," Steinberg says. "We want the biggest-possible audience." From that room of six, BuzzFeed has grown to a staff of 300, and 100 of them are reporters. Is there a lesson in all of this for the likes of The Washington Post? The paper, founded in 1877, with its Pulitzer prizes and historic investigations, runs a different operation, to be sure. But Steinberg sees a chance for some reinvention with Amazon's Bezos at the helm. "I mean, the Kindle platform is just one of the most powerful reading platforms in the world right now, and the fact that The Washington Post will theoretically have access to that in some way blows my mind," he says. Regardless of the platform, former Post Managing Editor Kaiser keeps his eye on the content. "The real question ... to me is: How can we preserve a big, talented, serious-minded news organization?" he says. "If we can preserve these, and preserve a tradition of holding the powerful people in society accountable for the ways they use their power, then everything will be fine. And my grandchildren will be OK."
But, he says, the revenue has to be there to sustain it.